The amount of space in the campgrounds has expanded enormously in recent times – with the introduction of Tom Mankeys, Outer Space, Bluegums and South Pines. Golden Plainers currently love creating more elaborate campsites – you know, extra tent, maybe a pergola lounge, a tarp, etc. All that means the same amount of people take up more room. Which is terrific – we got plenty. Tom Mankeys, a vast, elevated campground, has quickly established itself as the go-to place for tree-changers and naturalists looking for extra space, convenience and to getaway from the hoi polloi of the inner city campground scene. It boasts panoramic views over the Supernatural Amphitheatre, across the rolling pastoral scenes, beyond the old gold mine to erupting Krakatoa in the distance. And it’s just off Bush Camp. 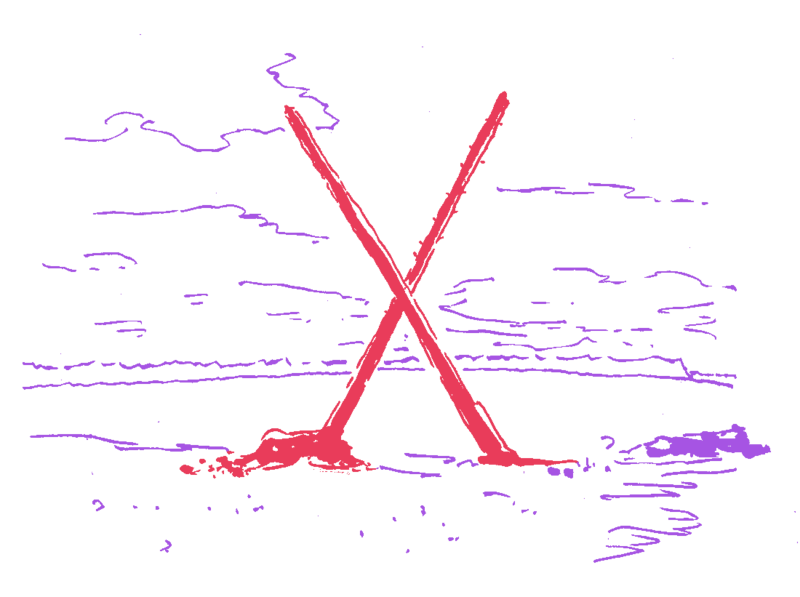 When it was first opened in 2011, the cartographers put an ‘X’ on the site map to mark its location. Sensing an opportunity to exercise his willful sense of humour, Uncle Doug went and built a giant, real X in the corresponding spot on the land! So it’s very easy to see Tom Mankeys from a mile away. Mankeys has its own Helper Hut, a path direct to the Amphi and two blocks of composting loos. It is covered in lush green grass and bordered by bushy windbreaks. Names of the various roads include Mulholland Drive, Sue’s Last Ride, Hanky Panky Parade, Dirty Boulevard, Straight Drive and Bent Street. As for the name of the campground, well, the original shortlist included Premium Economy, Upstairs, Glenn Ridge and Poland, but whenever we talked to the Nolan family (whose farm it is) they kept referring to the paddock by its actual name – Tom Mankeys. So rather than re-write history we figured it should be known as Tom Mankeys. Haven’t found out much about Mr Mankey yet but the name dates back to the nineteenth century.